Qaanaaq (*), september 9th, we have arrived at our destination, at the end of the 6th and last leg of this first big chapter, the place we have dreamed of for many years. To finally be here seems still unreal. Nanuq pulls on her anchor in a shallow bay a few hundred metres away from the village, protected from ice but not from the chilling wind blowing down from the ice cap (***). We experience first snow on deck. Although unheated, our contemporary 'passive igloo' is cosy and warm. Since our departure from Kopenhagen our log has counted 4700 nautical miles (~7500km). This kind of travel can't be compared top sitting in an airplane zapping from one place to another. We have sailed every wave, profited from every breeze, rounded many caps and seen thousands of different unique viewpoints along the way. We have had moments of waiting, doubt and tiredness, moments of joy, of discovery and awe. We have shared precious moments with a crew which has helped us with their presence and persistence to come here ... at the average speed of a pedestrian. We turn a page. And open a new chapter. Autumn will be dedicated to prepare the winter camp: preparation of the boat, installing the windmills and the scientific equipments. The days will get shorter and will give place to the first snowfall, the autumn storms and the formation of the ice. The remaining summer crew will leave the boat once the ice is formed. Fan Gletscher (77°32.5N 69°54.8W): mooring to the W of the delta formed by the streams coming form the glacier, opposite of Herbert Oe. Excellent hold in 7m sandy ground. Open to the S.
(***) Qaanaaq (77°27.9N 69°16.6W): very good hold in 5m in sandy ground. 5-6 cables to the W of the village. Protected by some underwater rocks that are visible at low tide forming a small bay, providing shelter from the drifting ice. 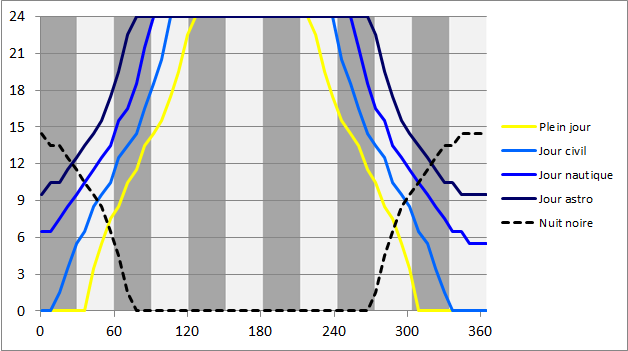 The approach is though a narrow passage, 2.0 to 2.5m depth at low tide, 77°27.8N 69°17.0W coming from the S. The depth in the bay is around 5m. No protection from the wind nor some swell at high tide. Access to shore by dinghy on the beach towards the village. 3/4G network. Don't miss à stop at Qaanaaq Hotel! The crossing of Melville Bay was fast. Half of the bay we were able to profit from NE winds, which slowly calmed down forcing us to continue by motor. The days are still long at this latitude; the sun disappears behind the horizon for a few hours, leaving nonetheless a blue twilight. Enough to see the small bits of Icebergs that cross our path! Our compasses start to mislead us, they are no longer accurate. When the sea is a little rough, the swell makes it hard for them to show a constant heading. The magnetic deviation is about 60°. Here this instrument that is key to accurate navigation comes to it's limits. We now follow the wind and the indications of our GPS. We are back from Siorapaluq, the northernmost settlement in the world. After speaking to the locals, we have yet again lots of new and useful information on the area. Combined with the information from our maps and satellite photos, it allows us to identify potential mooring places for our winter camp. Once these places are virtually located, we still need to go on place and carefully analyse the pros and cons. We are looking for several qualities: first of all protection from the open sea and drift ice, proximity to a village, access to a fresh water source (if possible) and finally, not to be to much closed in order to be able to take advantage from the wind for our windmills. Ideally would be an open view towards the S to see the first (and last) sunbeam! Qeqertarssuaq (77°25.4N 70°14.0W) : good hold in 5m sandy bottom in a little bay open to the NW (find a spot between the algae). Make a big turn around the W of the islets that close the bay to the N to avoid underwater rocks in the axis of the islets. Do not go further into the bay as the Islet to the W, there are numerous rocks! The end of the bay is dry at low tide. The abandoned village is 1.5km to the E of the mooring. There are several turf ruins along the coast. Barden Bugt (77°08.7N 70°43.1W): landlocked mooring with excellent hold in 15m sandy bottom, aprox. 80m from the beach at the end of the fjord behind a 'moraine'. Keep clear of shoals close to the different 'moraines' and Kap Powlett. Remains of an abandonned village along the N coast of the fjord. Glacier landscape. Over night there is a cold breeze blowing from the glacier. A potential winter camp mooring? To be tested in strong winds from the W (uncomfortable swell from the side may occur). This morning the summits of the surrounding mountains are covered in frost. The weather forecast for Melville Bay predicts -5°C. Upernavik is in the south. More and more, the landscape shows its true nature: blank rough rock. Our voyage continues North. The weather is on our side, although the lack of wind forces us to use our motor to trace our way. August-September is the period with least ice, allowing us to reach far into the fjords. The region of Upernavik is a paradise for every climber and alpinist. Majestic granite walls reaching steep into the sky. Big valleys, covered by a rich flora lead to snowed in summits up to 1500m. We are on the lookout for future travels, writing down what we see around us for future planning. But while our imagination is already in the future, the present has us searching for possible winter camps. 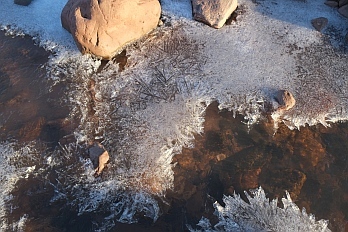 There are quite a few possible spots that would be suitable for the winter, even though the ice arrives relatively late in this region (December-January) and is quite thin (20-40cm). This can be a problem, as a lake of thick ice reduces the possibilities to travel freely between the winter camp and the close by village making access for friends and family difficult. During the delicate periods of freezing and melting of the ice, while the boat is not yet strongly frozen in by the ice, we are exposed to winds and drifting ice. We approach the glacier front of Upernaviks Isfjord. The glacier has retreated tremendously: we manage to go 20km deeper into the fjord as was possible 20 years ago according to satellite photographs of that time. Some lakes have simply disappeared. The landscape still has the visible marks of the former presence of this great mass of ice that has completely vanished as for now. At the foot of the glacier we find a little unexpected anchorage freshly uncovered from the ice (*). As always we profit immensely to go on land and discover this so absurd landscapes and are surprised by the speed with which new life takes hold on these uncovered rocks. Isfjord also gives us the first opportunity to touch fresh ice. 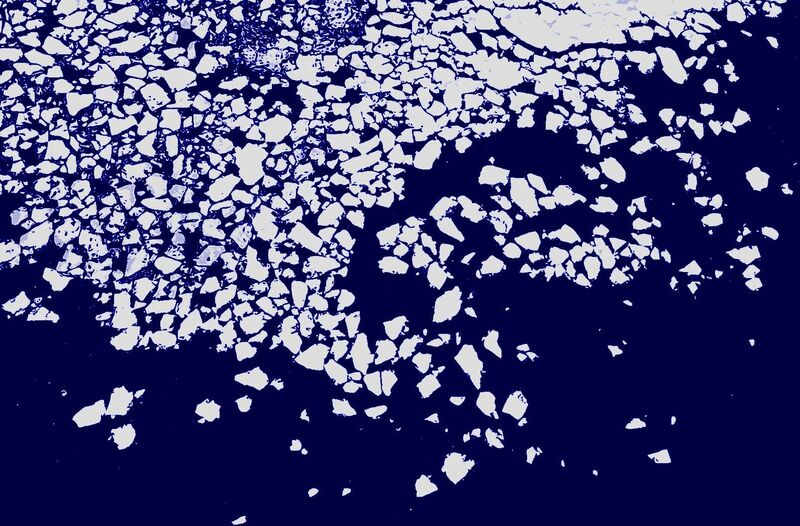 While the verge ice explodes with the sound of broken glass, the 15cm thick ice sheets crack with a deep thundering sound. We discover Nanuq in another light. 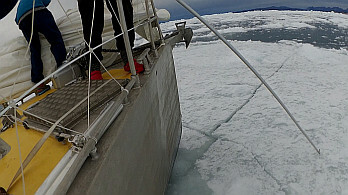 The reinforced bow easily pushes the big ice blocks that float along our flanks side, cleaning the hull from algae. The safety fuses of our tilting tiller work, avoiding destruction when we hit a big block of ice. Although the enthusiasm is very high we have to keep in mind that we are exposed to the elements and that caution and attention are essential. The possibility of a storm is high during autumn, so we always have an open eye for a protected plan B. While the voyage goes on, so does our scientific program: two weather buoys have been launched and are drifting in the Labrador current, a third one will be launched in Melville Bay. The absorbers from the Université de Savoie are soaking up particles and for the Université de Brest we are collecting water samples every 3 or 4 days. Every day brings us something new: a new experience, a new encounter, a new environment. The versatility of this country is breathtaking even though it's ingredients are so scarce. It is this ever changing coast that surely gave name to this country as well as its people, as it is the country of man. We are impatient to go into the coming season and experience this beautiful country under a different light. (*) Isfjord, island without name (72°48.2N 54°15.5W): 13m deep, fine sand bottom. Good hold for anchor in good weather. 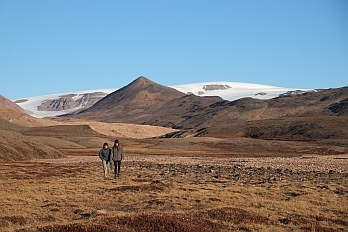 Possibility to access the Greenlandic Ice-Cap. Beautiful sight onto glacier. 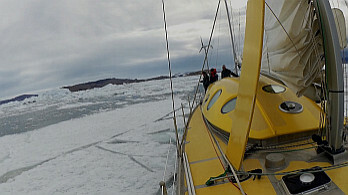 Fjord without name (72°48.2N 54°15.5W): very good mooring protected from the wind and the ice. Sandy/muddy ground with good hold (algae can be avoided). The end of the fjord is accessible with some local knowledge (rocks in the passage - pre-sounding with dinghy recommended). The little bay at the end of the fjord is potentially an all weather/all year round mooring place. Fresh water stream close by, on the exposed S side of the bay. There seem to be some rests of a summer camp of local fishermen. The big waterfall shown in the N of the fjord no longer exists. Appilattoq village (72°52.3N 55°34.2W) : excellent small natural harbour used by local fishermen. Good hold in the middle of the main basin at 13m, in sandy bottom (depths vary between 6-18m). Approach from the W through a little passage. It is recommended to stay in the middle (8m), as there are some rocks to both sides close to the shore. Care should be taken when moving inside of the bay as there are some isolated underwater rocks in the main bay and the passage leading to the smaller bay to the E. Fresh water lake 15' away by foot. Distance to inhabited village ~2km - easy walk. GSM connection. Atiligssuaq (72°46.9N 55°51.4W): small bay perpendicular to the main fjord. Well protected from the predominant winds. Sandy bottom (unverified hold). Good mooring can be obtained by anchoring in 12-15m water and attaching two lines to the shore. Bay to the South of Umiasugssuk (72°45.8N 55°53.9W): good anchorage on sandy/rocky bottom. Small beach on the S of the rocky isthmus that closes the bay to the NW. Steep mountains on both sides of the bay. Many climbing possibilities. Several waterfalls in the surroundings. Old snow at sea level (August). Quite visited by locals. Avoid mooring to close to the flanks of the mountains, danger of falling rocks! Nutaamiut (73°31.1N 56°25.1W) : Village marked as disused on charts but inhabited: new infrastructure (fishing plant, GSM antenna, houses). Anchorage can be found to the E of the GSM Relay antenna (50m from the chapel) at 0.2nm from the cost. Sandy/rocky bottom, 6m deep. Caution is advised, there are some shallower spots. There is no peer, but a protected stone wall equipped with rubber tyres at the foot of the crane to the S of the village. The anchorage is not well protected from ice although shallow bottom keeps big icebergs away.